Campeggio Els Ports si trova a Arnes, Tarragona. Questo campeggio dispone di piazzole delimitate, sia ombreggiate che e piazzole poco ombreggiate. È possibile affittare bungalow. Il campeggio dispone di un parco giochi e di un campo sportivo. Ogni anno un ispettore visita il Campeggio Els Ports, controllando oltre 200 tra attrezzature e altri punti di interesse del campeggio. L'ispettore è un dipendente ACSI e non lavora per il campeggio. Rather expensive for the small dirt pitch that we struggled to fit our camper into head on. The welcome could have been warmer/friendlier, however the staff in the bar made up for this. A generally clean, neat and pretty campsite, 20 minutes walk into a very interesting town. Good, inexpensive bar/restaurant with a pleasant pool area. Excellent toilet/shower facilities, some of the best we have seen in our travels. Easy to find. We stayed here in February for a couple of nights. We decided to come back and stay for longer. The lady on reception, who I believe maybe the owner, was very friendly, the same could not be said about the guy in the bar/restaurant! The toilets were not quite so clean this time, but were still of a good standard. What spoilt it for us and caused us to cut our stay short, was an arrival of a school party. We felt that this campsite is too small to accommodate a school party without infringing on other guests. I think that most people who come at this time of year, do so because they know that the sites are generally quiet and there are not a lot of children about. It is a shame as we were really enjoying the site and the surrounding area. It has made us think twice about going back. A very quiet and very spacious campsite in beautiful surroundings. The pitches were the biggest I have seen in Spain and in general the facilities were of a high standard. This is an excellent area for walking and cycling with beautiful riverside walks in impressive mountain scenery and a lovely, long via verde which is suitable for cyclists and walkers of all abilities (even for wheelchairs). As elsewhere in Catalunya a tourist tax of 1 euro per couple per day is made in addition to the normal fee. 3 amps is not ideal for your electrical gadgets but it is adequate if you use your gas bottle too. Wifi is not available on site but bars in the nearby villages mostly have free wifi. We shall certainly come back. This is a very nice site. The staff are very friendly, the showers, toilets and washing up areas are immaculate. Due to the time of year that we were there (Feb 2013) the restaurant was closed and the site was empty. Never the less, we were made to feel very welcome. We will return again. Volete prenotare il Campeggio Els Ports o oppure saperne di più? Potete farlo usando i seguenti dati. AP7 Barcelona-Valencia, uscita 40 per Tortosa, continuare verso Lleida fino all'uscita Horta/Sant Joan. Poi a sinistra per Arnes T330 (40 km dalla AP7). Dopo 3 km sulla destra. 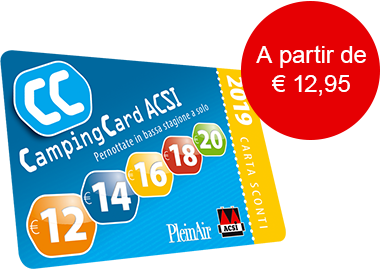 ACSI Eurocampings invia la tua richiesta di informazioni al "Campeggio Els Ports".